PT Tech's new CDB0812A replaces 8" drum brakes and conforms to the new AIST brake standard. If the installation conforms to AIST's dimensional standard for DC mill motors, then when ordering all that is required is the DC mill motor number and existing electrical coil specifications. In all other installations, please provide a drawing of the existing brake drum. 12" inch disc replaces an 8" drum. PT Tech supports its commitment to excellent field service with a large inventory of parts and a 24-hour emergency service. When Converting The CDB0812A directly replaces an 8" drum brake. It has the same mounting footprint and torque capacity as an 8" drum brake. When converting, it is critical that the disc's centerline is in the same position as the drum's centerline. Single-acting caliper disc brakes impose a bending moment. Shafting should be reviewed prior to installation. Consult PT Tech. In most cases, PT Tech can suggest mounting adaptations for non-standard drum brakes. 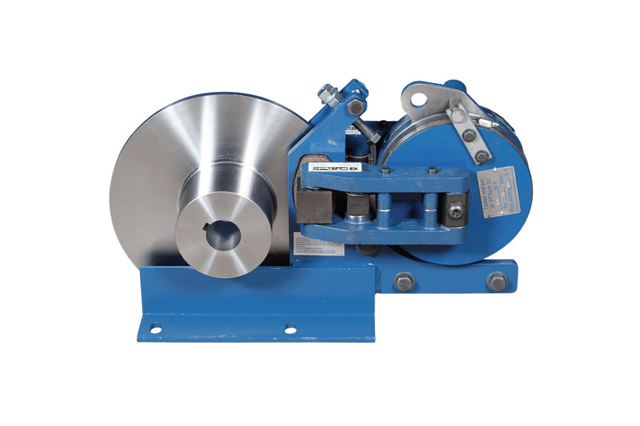 The simple and rugged design makes the new CDB0812A well suited for North American steel mills. There are four major components to the brake: coil, arms, base, and friction pucks. The arms, base, and friction pucks are similar to PT Tech's other CDB brakes, but the coil is entirely new. It greatly simplifies the design and reduces the total number of parts. The coil is potted into a magnetic body. Coils are available to operate in series with DC mill motors or in shunt circuits. The size and shape of the coil/magnetic body was de signed using sophisticated computer software. The software optimizes the flux density without causing a heat problem. The coil/magnetic body is connected to the base on 3 bolts. On top of the magnetic body is an armature gap indicator and a lifting lug. When the indicator has recessed 1/16," the brake requires adjusting. Adjusting for wear is a two minute job. The lifting hole is positioned to provide a balanced brake assembly. This helps to make installation easy. There is a friction puck wear adjusting bolt on one side and a torque adjusting bolt on the other. The wear adjuster bolt has a hex head requiring a 12" adjust able wrench. The torque adjusting bolt is a button head requiring a 3/8" Allen wrench. Having different types of bolts helps to eliminate mistakes when making adjustments. adjustments. The patented slotted base allows for ease of installation and removal. Like PT Tech's other CDB brakes, the base's tower has machined pockets to hold the friction pucks. During actuation the tower takes the reaction load allowing the arms to move freely to accommodate axial motor movement. The CDB0812A uses only two pucks. A set of pucks weighs 4% lbs. Replacing worn friction material takes less than 10 minutes. PT Tech has been analyzing and solving shockload problems for heavy industry since 1980. Our application engineers regularly visit mills to better appreciate the problems that plant engineers and maintenance people face when trying to solve a shockload problem. In addition, PT Tech's application engineers have two unique tools to assist you. First, our test stands can simulate the inertia shockload up to that of a #820 DC mill motor in the attempt to better understand how a torque limiter will perform in your application. Second, using thousands of test results, PT Tech has developed a computerized selection program that quickly determines the best solution to your shockload problem.